Three weeks after Golden State Warriors-owned League of Legends team Golden Guardians fired head coach Yoonsup "Locodoco" Choi, the former coach broke his silence. Choi, who was fired just four games into the team's season, said tonight that his firing was a result of him telling a "personal story" which was not "sexually explicit," but also "totally inappropriate" for an interview. 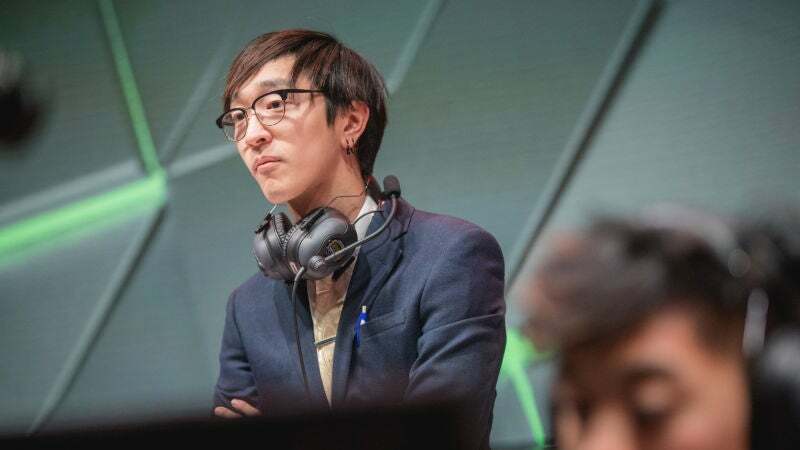 ESPN reported earlier this month that the firing was related to an inappropriate remark made to a woman, and Locodoco tonight said that it could "remotely be construed or interpreted as sexual harassment." Know anything about exactly what Locodoco said or who he said it to? Email me or our tips line. Not directly related, but the idea people can be fired because someone else perceives something they say in an entirely different manner or context is quite concerning to me. It's approaching the point where people can accuse you of harassment for saying hello on a daily basis and then you have to prove your innocence, instead of the accuser having to prove anything at all... And to the other extreme, I've literally been witness to cases of people taking others to HR because someone didn't say hello to them that day. I don't disagree, but I've yet to see a situation where just saying hello (or not saying it) has required HR to step in, usually it's something else that's compounded the situation. In saying that I've seen more situations where HR have completely ignored some serious behaviours or completely overreacted due to fear of backlash on the company. Well HR exists solely to cover the employer, not the employees, anyone thinking otherwise is incredibly misguided. Unfortunately in some places it is disgustingly to the point where they'll do things to make someone's work life miserable until the person quits of their own volition. Problem is that people (Especially anyone under the age of 40) go through life expecting to be treated like golden children, and when someone doesn't follow that ideal (Like not saying hello to every single employee you pass), they think you've taken some personal vendetta against them. It goes even further if the two parties are of different races. I've seen some one get in trouble for not saying good morning. It was apparently bullying because they said it to almost everyone else. Yeah that's usually when it becomes a big deal. The future is so boring. I find you taking offense, offensive.